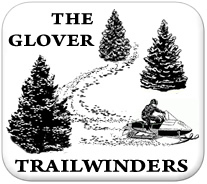 The Glover Trailwinders is one of the oldest snowmobile clubs in Orleans County having its roots with the Albany Creek Runners in the late 1960s. A difference of philosophy about the sport of snowmobiling led to a split and the formation of the Trailwinders. On November 3, 1976 the club was officially incorporated as The Trail Winders Snowmobile Club. In its earliest years the club was primarily a social organization but also did informal work building and maintaining trails. Trail construction and grooming as we know it today wasn’t even on the horizon. Rudimentary grooming efforts consisted of dragging a few tree branches behind a sled until it was discovered that dragging an old bedspring behind the sled did a better job. Eventually the club obtained a “groomer” that could be adjusted to cut into the moguls and drag the loosened snow into the hole between the moguls. In the early years the trails in the Glover/Barton/Albany/Irasburg area were the responsibility of four different clubs. With no consensus between the clubs on the type of trails to be developed no uniform network of trails was developed and hence no money was forthcoming from VAST for trail construction, grooming equipment purchase, or grooming expenses. Without VAST funding it was up to the local clubs to raise the money necessary to maintain the trails. By the early 80’s the Trailwinders had managed to purchase an old Alpine Ski-Doo and a 4’ wide drag. To raise the necessary funds the club held a gun raffle for several years, and in 1986 the longest running Poker Ride in Orleans County was started. After several years of fund raising we purchased an old Bombardier sidewalk plow to pull the drag, but that was a poor choice. After a frustrating season with the sidewalk plow we traded it for another Alpine and were back where we started. As the workload of the few volunteers in each area club began to wear on the workers the other clubs gradually folded and turned over their trails to the Trailwinders. This allowed the club to build a network of trails that connected to the corridor trails being maintained by surrounding clubs. In the mid-90’s the Trailwinders established the first VAST supported trails in the area, grooming with two very decrepit Ski-Doo Alpines. Our network of trails was gradually expanded to 50 miles and in 1998, with the help of a VAST equipment grant, a used LMC 1500 and an 8’ Mogul Master drag were purchased. The LMC wasn’t much of a grooming machine, and after struggling with it for two years it was sold and we entered the VAST leasing program. With a brand new Pisten Bully PB 100 the trails in central Orleans County took a quantum leap. And the club won the “Most Improved Trails” award. Raising funds to support the trail program has always been a club priority, and in 2001 a very successful 4-wheeler raffle was run and has been held each year since thanks to the efforts of Vice President Dale Perron. The fund raising projects enabled the club to purchase the PB 100 at the end of the 5-year lease period, and today the club is ready to purchase a new groomer when VAST funding is available to go along with the funds the club has raised.. The past few years we have decided to give a monetary prize instead of a 4-wheeler. Our groomer is located on the Stevens Road, which our club purchased in 2012, in W. Glover during winter months, making it the central location of our trails system. Grooming of the trails in the Glover Trailwinders’ area is the responsibility of Jim Rodgers & Mitch Brousseau, groomer operators, to see that the trails are kept in top condition.